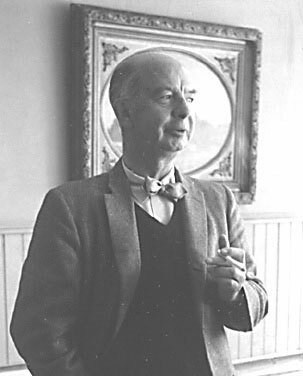 My mentor, Harold Irving Smith, was born in Newport RI in 1892 of New England Yankee stock. His father was a photographer whose customers included wealthy summer visitors, some of whom, according to Harold, rarely paid their bills in the same year they commissioned the work. 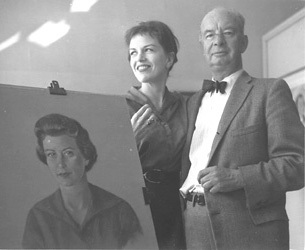 Harold returned to Newport in his later years and this photograph was taken at his storefront studio on Bellevue Street in 1958. 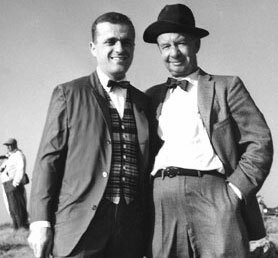 This is the two of us on a bluff overlooking what we could see of the Americas Cup Race of 1958 in which the USA was victorious whenColumbia beat Britain's Sceptre. My young wife, Ruth, was 26 at the time. Harold described her as "quite a dish." 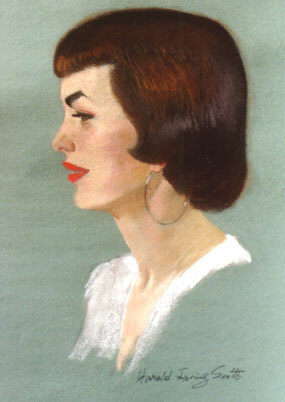 He liked her so much that he did a couple of portraits of her. This is a work in pastel on a 23 x 29-inch colored sheet of Strathmore pastel paper. In this close-up you can see how he worked in the various shades of flesh colors. Click on image to enlarge. Me as a kid, 1946. I was almost 18 and had dropped out of Massachusetts College of Art to work in Harold's studio. It was on the third and top floor of a beat-up building at 34 La Grange Street in Boston, just on the edge of what was called "The Combat Zone." On the floor below was a sign painter's workshop, just above Eddie Jordan's barber shop. Eddie's son Bob and I were friends and when Eddie heard I was going to art school, he said he would introduce me to Harold, which he did. Such as it was, Harold liked my work. I offered to work for him sweeping floors or whatever it took to get the kind of mentoring I felt I needed. As it turned out I did very little floor sweeping, though another young guy and I painted the studio, which I recall included a long expanse of ceiling fabricated of an embossed metal design. It seemed to be an unending and messy task that would have been so much easier with a spray gun, had we known where to rent one. 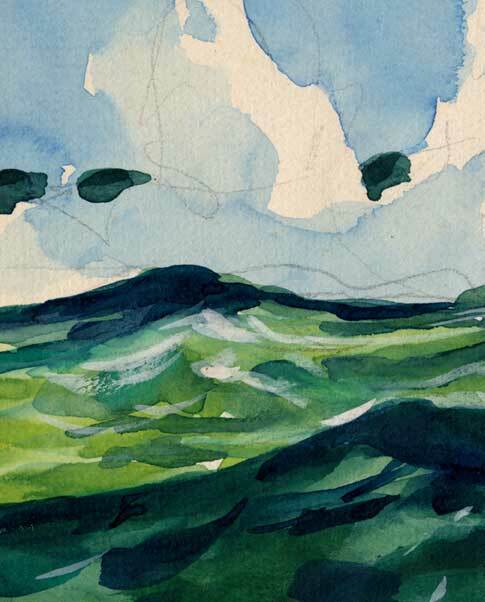 Click on the image for a close-up showing detail. 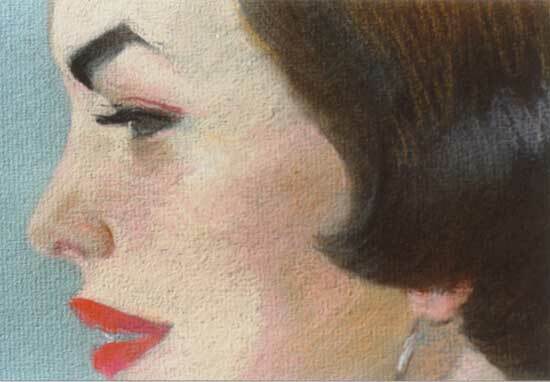 Though Harold concentrated mainly on portraiture in oils and pastels, he did an occasional illustration for Boston and New York advertising agencies. This is a full page from LIFE magazine that was painted for black and white reproduction. The client was John Hancock Mutual Life Insurance Company. 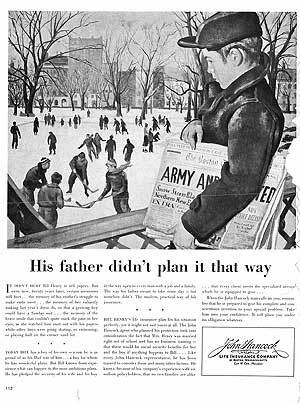 The background is of Tremont Street in 1944 with kids skating on the Frog Pond on Boston Common and the model might have been his grandson Jimmy. It predated my days in the studio so it's an just an educated guess. The famous American painter and teacher Robert Henri (pronounced hen-rye) was Harold's instructor at the Art Students League in New York City which Harold attended after service in the U.S. Navy during World War I. (Harold was a jazz drummer whose Navy service was in a marching band. In 1918 he contracted and recovered from the Spanish influenza pandemic that eventually killed millions throughout the world.) While in New York he made friends with members of the Ashcan group of painters, among them Everett Shinn and the hard drinking and disagreeable George Luks. George Bellows was another acquantance whose death at an early age he often recalled with great sorrow. 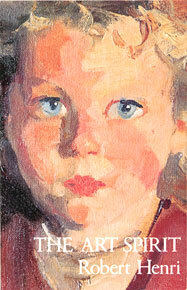 The Art Spirit is one of Henri's great books and highly recommended to anyone who contemplates a career in the arts. Any of the larger search engines on the Web will locate much more information about Robert Henri, Everett Shinn, George Luks and George Bellows. 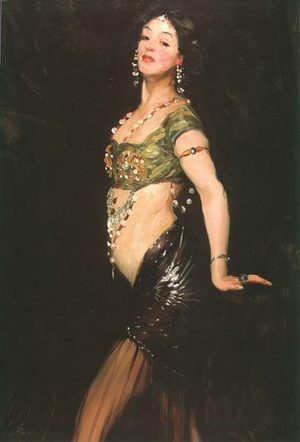 Salome by Robert Henri, 1965-1929. An oil painting circa 1909. Click on image for enlargement. 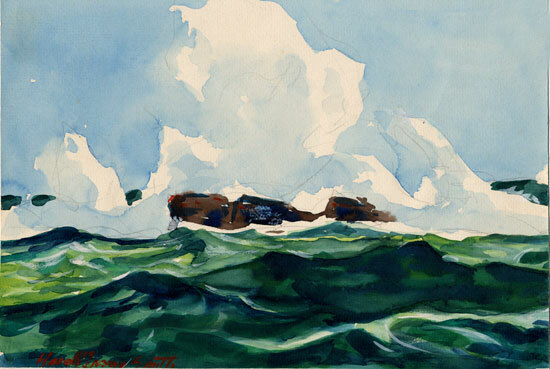 Watercolor, 11.5 x 7.75 inches, of surf crashing on the rocks at Newport. It was probably done in the early 1950s. It was given to Ruth and me during that period. It's a sheet from a pad of watercolor paper on which Harold laid on a wet wash of color over a very rough sketch in pencil. Click on each image for more detail. Update 21 January 2006 Harold's grandson, Jim Keith, and his daughter, Amy, have been kind enough to pass on the image of a painting Harold did for the Thornton W. Burgess Society Museum, which is located on Cape Cod in the town of Sandwich. 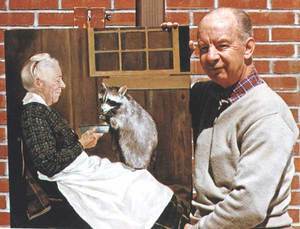 I remember when he was doing this painting, which is from a photograph of the original Bobby Racoon being fed by one of Thornton's neighbors. For more about this prolific writer of childrens books, who lived to be 91, click on this link. On a whim today I decided to look up the artist Harold Irving Smith who signed the wonderful painting of my father-in-law, Bob Metzger. 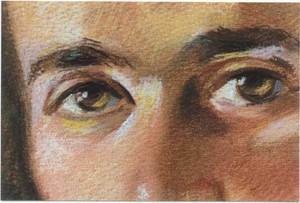 I have always admired this painting and asked to have it when he died in 1995. Commander Metzger was one of the Navy divers who rescued 105 men from the submarine, Squalis, in 1938. He made Commander in 1958 in Newport, Rhode Island when the painting was done. He went on to be an Executive Officer at the Portsmouth Naval Shipyard and then he retired to Charleston, South Carolina. I was happy to find what an accomplished artist Mr. Smith was and am even happier to know that I recognized quality artistic talent when I saw it as a young woman! Thank you for posting the web page about Mr. Smith. Sorry, Garrett. I don't recall their names. It was a long time ago. Who were the 2 former patrons that had him moved to Melbourne, FL? Bless you, Susan, for remembering this dear soul. How thoughtful of your Dad for his gift. Many thanks for the information on Mr. Smith. 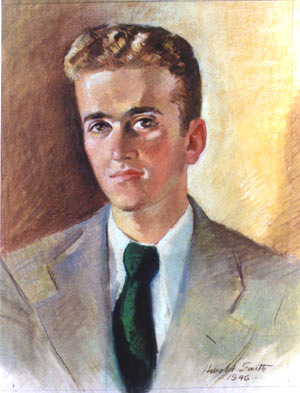 He did a portrait of me in 1963 when I was 9 years old. It was a gift to my Mother from my Dad. I remember Mr. Smith coming to our home and my sitting for him. I also remember his store on Bellevue Avenue. Thank you.